CBSE Syllabus For Class 8: The Central Board of Secondary Education or CBSE is a national level board in India. It is responsible for secondary and higher secondary education in the country. Every year it conducts the Class 10 and Class 12 board exams for all schools affiliated to the board. It also monitors and maintains the quality of education from Class 1 to Class 12 in CBSE affiliated schools. The exams for Class 1 to Class 9 and Class 11 are, however, conducted by the respective schools. The guidelines of the exams, like the syllabus and marking scheme, are set up by CBSE. Students of Class 8 in CBSE affiliated schools follow the NCERT curriculum as per the recommendations of the board. Students must know the CBSE syllabus for Class 8 in order to prepare for their exams. In this article, we will provide you with the detailed CBSE Syllabus for Class 8, for all subjects. Read on to find out. Class 8 is extremely important for every student and must be taken seriously. The Class 10 syllabus, based on which the 10th board exams are conducted, is related very closely with the syllabus of Class 8 and Class 9. In order to secure a good score in your Class 10 board exam, you need to have a proper understanding of the concepts and topics of Class 8 and Class 9 as well. Also, at this point, you can appear for various competitive exams, like the Olympiads and NTSE. These exams and scholarships are highly prestigious and will have value all throughout your life. But in order to crack these exams, you should be serious in your Class 8 preparation as well. NTSE, especially, is totally based on the NCERT curriculum and if you are planning to appear for it, studying seriously from Class 8 will give you an edge over others. So, it is very important that you know the detailed CBSE syllabus for Class 8 for all subjects. 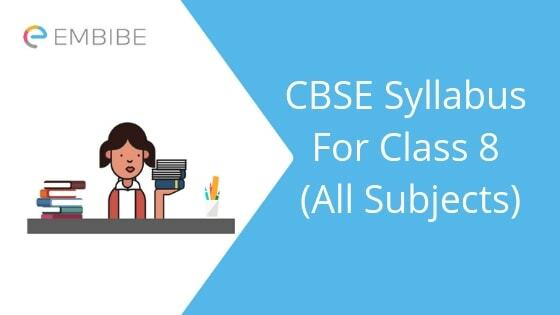 But before getting into the detailed CBSE syllabus for Class 8, let us have a look at the different subjects that students of CBSE Class 8 have to prepare for. Under CBSE, it is expected that students study three language subjects up to Class 8. Hindi and English are compulsory. The third language subject (additional subject) could be one of the languages as specified by CBSE. Let us now look into the CBSE syllabus for Class 8. We have separate articles for each of the subjects of CBSE Class 8. These articles provide a detailed syllabus of CBSE Class 8 subjects – chapters and concepts included for each subject. The links to the articles are provided in the table below. You can click on the link and visit the pages to check the CBSE syllabus for Class 8. Knowing the detailed syllabus will help you plan your preparation. You can have an idea about where you need to spend more time based on your strengths and weaknesses. It will ensure you do not skip any topic by mistake. You will be able to start your preparation early for various competitive exams. So, now you have a complete understanding of CBSE Class 8 Syllabus for English, Hindi, Maths, Science, Social Science, and Sanskrit. Create a realistic timetable allocating slots for each and every subject. Finish the entire syllabus as early as possible and then start your revision. Your basics should be absolutely clear. Make notes of important points, formulas, definitions, etc. as you study. This is especially needed for your annual exams. For competitive exams, you need to solve questions that need analytical and logical skills as well. You can solve the free CBSE Class 8 practice questions on Embibe for Mathematics and Science. You can also take CBSE Class 8 mock tests for these subjects. These will be of great help to you. We hope this detailed article on CBSE Syllabus for Class 8 helps you. If you have any question, feel free to ask in the comment section below and we will get back to you at the earliest.